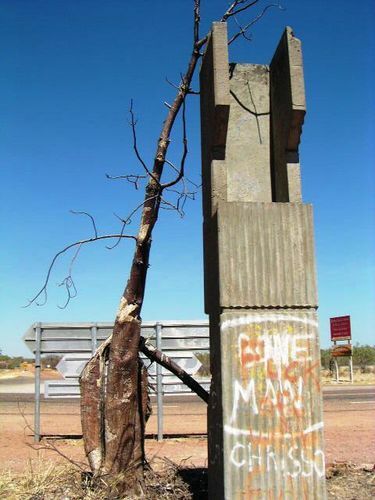 The Beef Road Monument was erected to commemorate the completion of the Victoria Highway. As at September 2012, the monument has been defaced and the plaque is missing. Originally a series of unformed tracks linking pastoral holdings, the route was developed as a gravel road in the 1950s to aid the beef industry. Improvements took place in the 1960s which tied in with the development of the Ord Irrigation Scheme, which enabled the introduction of road trains. It was designated as National Highway in 1974 and was fully reconstructed and sealed to a good standard by the early 1990s. The highway serves pastoral, mining and tourism industries, as well as the Ord Irrigation Scheme agricultural development near Kununurra.